I hereby proclaim it officially tomato season. It’s possible that it has been tomato season for a week or two now in some areas of the country, but we are just now in full swing here. I know this because my tomato plants are exploding with real tomatoes! None of them are ripe yet unfortunately, but soon! Of course, real tomato farmers are much better at growing things than I am so their tomatoes are looking really good these days. And so I wanted to use some of these bad boys in a pasta dish. Here’s the fun part about this dish. The sauce isn’t cooked at all. 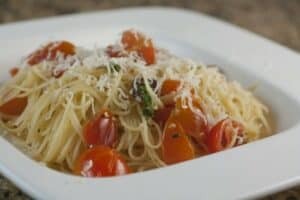 Unlike this cherry tomato pasta dish which has really deep, rich tomato flavors, this dish is nice and light and fresh. Perfect for a hot a summer day which a good number of people are experiencing these days! 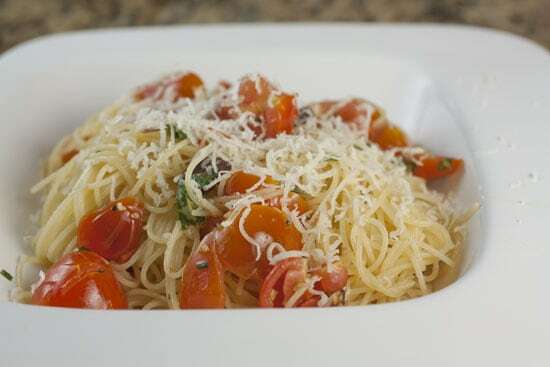 Light angel hair pasta tossed with a no-cook cherry tomato pasta sauce. 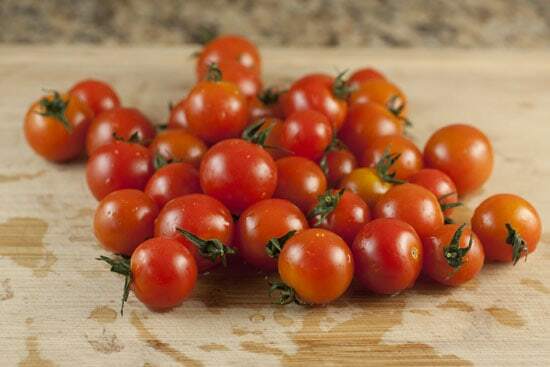 Perfect for really ripe summer tomatoes. 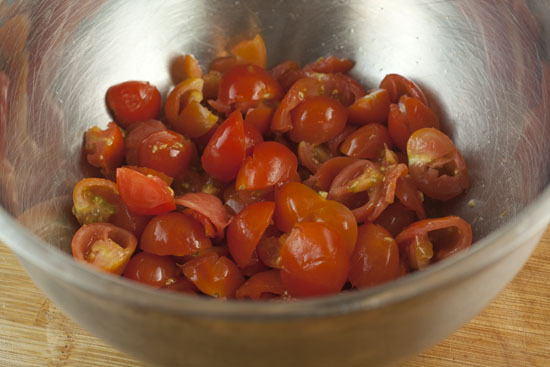 1) Wash cherry tomatoes and cut them in half. 2) Squeeze each half into a large bowl. 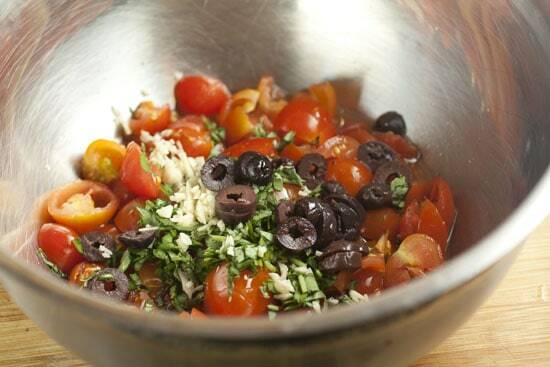 3) Add olive oil, vinegar, chopped herbs, minced garlic, and diced olives to bowl. Stir to combine. 4) Let sit for 10 minutes, then taste for salt and pepper. 5) Cook pasta according to package. Be sure not to overcook it. It’ll cook fast! 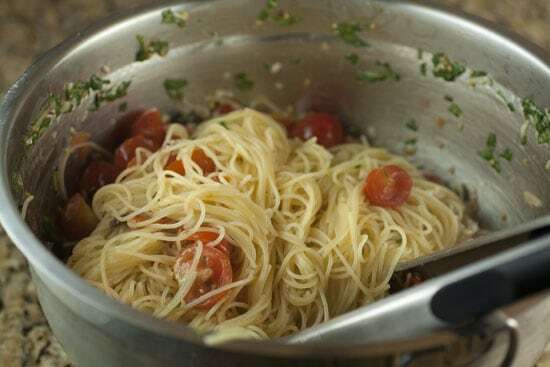 6) Drain pasta and toss it in with tomatoes. Toss well to combine. 7) Serve immediately with Parmesan cheese! This is honestly one of my favorite pasta sauces I’ve made recently. I’m not even sure if you can call it a sauce. It’s more of a mix-in. But it’s delicious so just go with it. Before we get to that though, I have to show off. Check out my exploding basil plants! I’m really proud of them because I’ve always had a hard time getting basil to really take off. These guys should last me all summer! The real star of this recipe isn’t the basil though, it’s the cherry tomatoes. Be sure to find the ripest ones you can. Wash these guys and cut each tomato in half. Then give each half a little squeeze and toss it in a large bowl. This will squirt out some of the ripe tomato juices and also bruise the fruit a bit which is good for a dish like this. If you happen to have children, I’m sure they would love squirting tomato halves into a bowl so recruit the kids to help. The reason I know this is because I really enjoyed it and I’m basically a big old kid. When all your tomatoes are squashed you’ll have a big bowl of, well, squashed tomatoes. There’s good juice in there. This isn’t much now, but we are gonna turn it into something awesome. You’ll need this stuff to start. And because I have a hard time getting everything together for one family photo, you’ll also need these things. Mince the herbs and garlic really fine and don’t use more than a clove of garlic. One clove is more than enough because the flavors are pretty subtle here. Garlic can over-power pretty easily. 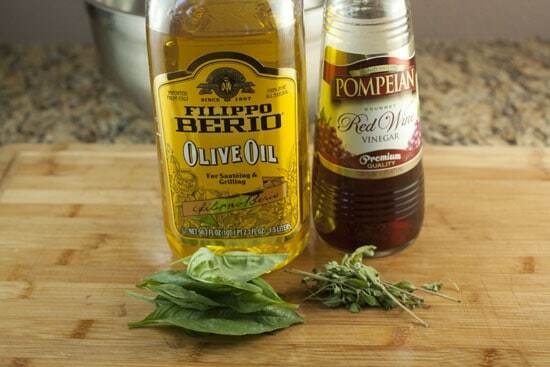 Add these things along with the chopped olives, olive oil, and vinegar. The vinegar is very important. Definitely not optional, but you could use white wine vinegar. I wouldn’t use balsamic. It’s too heavy. A great no cook sauce! Mix this all together and, here’s the important part, let it sit for 10 minutes. That ten minutes will give all the flavors a chance to really meld together. If you notice that there’s a cup or two of liquid at the bottom of your bowl, don’t worry. That’s good. That will all be soaked up by the pasta and turn into a delicious sauce. Just let it be. Do taste the “sauce” though for salt and pepper. It’ll probably need a good pinch of both. You could use a lot of different pastas for this dish but I went with angel hair because it’s nice and light. It also happens to be my wife’s favorite pasta so sometimes I have to let her get her way! Angel hair is a great pasta for the summer because it cooks in, like, 4 minutes. Done deal and then you can turn the stove off! Once it’s done, drain it and toss it right in the bowl with all the tomatoes while it’s still steaming hot. The heat from the pasta will soften the tomatoes a bit and just make everything work. 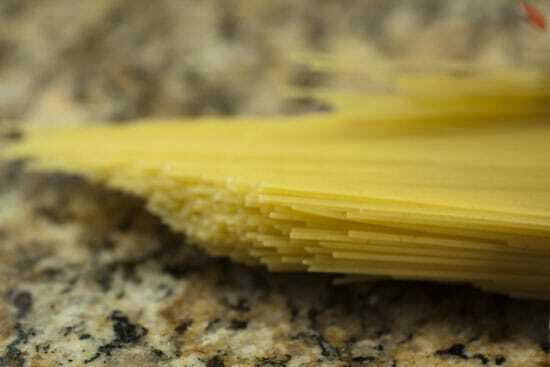 Use tongs to really mix the pasta together with the tomatoes to make sure that everything is tossed together well. Then just serve up a big helping of it with some parmesan cheese on top! For my money, there’s not much better than a dish like this in the summer time. It uses really fresh ingredients, doesn’t require a lot of stove time, and takes just a few minutes to toss together. It’s healthy and light, but still flavorful enough to be filling. So what I’m saying is… you should make this dish. This sounds delicious, it's definitely going in my "to make" pile. :-) And anything that doesn't heat up the house when it's 106° outside is definitely a winner. That looks awesome! I can't wait until my garden tomatoes turn red. In the meantime, I think I'll hit the farmers' market. I think I will, in fact, make this tonight.! It looks and sounds FANTASTIC! Simple and fresh. Great photos! 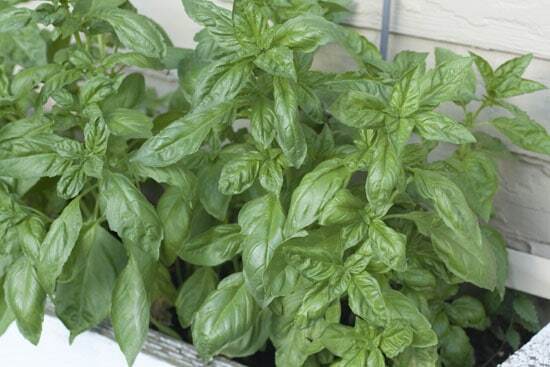 I have a case of basil plant envy! Key with crushing those tomatoes. I make a similar "sauce", without the olives. I add some cubed ricotta salata. Ricotta salate is salted and dried ricotta cheese. 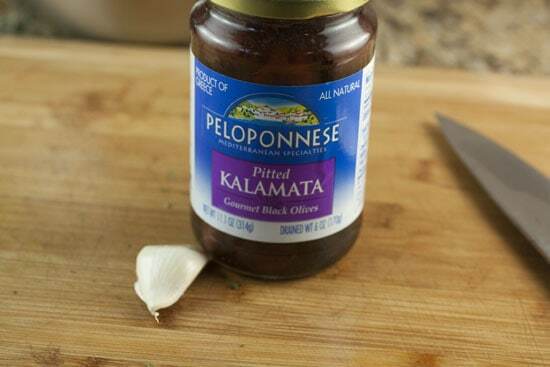 It's very salty, and has the consistency of a nice, crumbly fetta (you can substitute fetta in a pinch). On its own, the ricotta salata is almost too salty to eat, but, combine it with the tomatoes, and the majority of the salt is pulled out of the cheese and into the tomatoes. The tomatoes release a considerable amount of juice. While I usually toss this with hot pasta for a no-cook tomato sauce, it also works well as the base for a summer pasta salad. I just add fusili pasta that's been cooked, rinsed with cold water, and drained – usually about half, by weight, of what I would use for a hot pasta dish. As a side dish, it's perfect as is, but for a main course, I may add some diced, dried salami (get the good stuff!) for some added protein. Wow that sounds amazing and my tomatoes are just about ripe!! Yay for garden tomatoes! At last, tomatoes with flavor again! I love to see garden capitalizing recipes! More Nick! More! My son and my husband both wanted to take the leftovers to work today….sadly there was only enough for one of them. I made this for dinner the other night, as the cherry tomatoes in my backyard were ripe for picking! My parents raved about the dish. In fact, my dad loved it so much that he ate most of mine.. but thank you for this delicious recipe! Made it for supper last night – was very tasty. It satisfied the hub who doesn't like cooked tomatoes in sauce, and me who doesn't like raw tomatoes. The squishing and the hot pasta got rid of enough of the nasty raw tomato slimy gunk. Unfortunately my tomato plants aren't doing well, so I don't know if I'll have enough for another dinner. i made similar dish few weeks ago – like here, pasta, cherry tomatoes plus grilled zucchini and eggplant. And some red onion and crumbled feta on top. Delicious. « Beet Stuffed Beets Recipes Home » The Internet Kitchen: Vacation!